Food. We all love it, especially those foods that are healthy and help contribute to disease protection. And if foods fail, medicines can help manage or stave off some diseases. But whats also true â€“ and many times unknown “ is that combinations of medicines and foods don’t always mix. 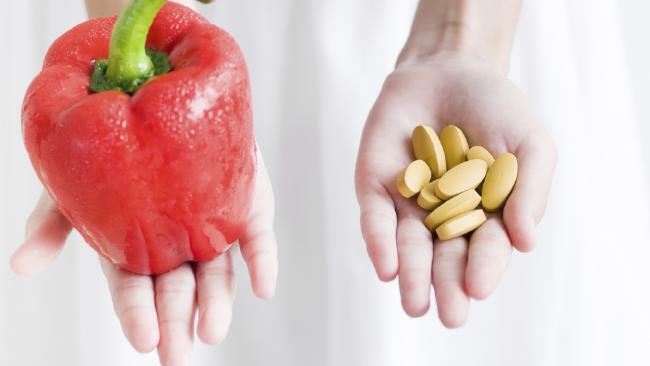 In fact, some foods can dangerously alter or even negate the benefits of certain medications. In 2008, spending for prescription drugs in the U.S. was more than double what it was in 1999. Can you guess that dollar value*? The CDC reports that almost 40 percent of older Americans used five or more prescription drugs in the past month, with the use of multiple prescription drugs increasing by 20% and the use of five or more drugs by 70%. And with 150 million Americans gulping down prescription medications, that’s cause for alarm, I say. Cholesterol-lowering medicines like Zocor, Crestor and Lipitor have been shown to effectively lower cholesterol for many by blocking a substance your body needs to manufacture cholesterol. They may also aid your body in reabsorbing cholesterol that has built up on your artery walls, which helps prevent further blood vessel blockage and subsequently, heart attacks. But pairing statins with grapefruit juice can increase its potency by up to ten times the amount you really need and cause damage to your kidneys. Lifestyle changes like quitting smoking, managing stress, getting regular exercise (at least 30 minutes a day most days) and eating a healthy diet low in fat, cholesterol and salt can go a long way toward lowering cholesterol. This matters> Lipitor lowers the production of coenzyme Q10, an essential nutrient that transforms carbohydrate and fat into energy. If you are taking it, talk to your healthcare provider about supplementing your diet with CoQ10. So does this> Other grapefruit/medication interactions include the anti-anxiety medication, BuSpar, antidepressant Zoloft, antihistamine Allegra. Anti-Depressants, Fruits and Aged Cheese. Â Certain antidepressant medications known as MAOIs (Monoamine Oxidase Inhibitors) like Marplan, Nardil and Parnate don’t mix well with aged hard cheeses (which contain a substance called Tyramine) like Blue, Camembert, Emmenthaler, Stilton and Swiss, causing dangerous spikes in your blood pressure. Also beware of fruits such as bananas, raspberries, dried and overripe fruits, especially avocados and figs. Blood Pressure Medications and Licorice. ACE inhibitors or diuretics to regulate blood pressure do not pair well with licorice. The licorice could interfere with the effectiveness of the medications, or could even worsen the possible side effects. Licorice can cause the body to get rid of potassium, as can diuretics, resulting in too-low levels of potassium, which can affect your heart, nerves and muscles. Symptoms of low potassium can be mild or vague, or can include nausea and/or vomiting, heart palpitations, constipation.